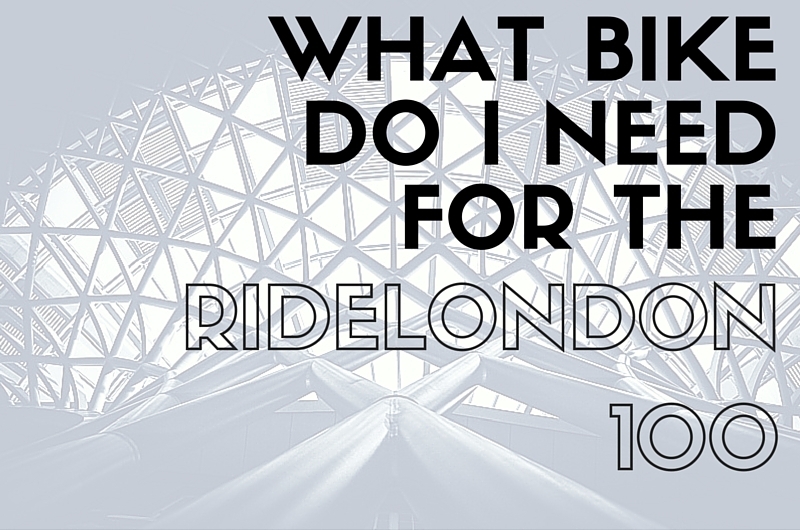 What Bike Do I Need For The RideLondon 100? … Or indeed any other 100-mile sportive or gran fondo? 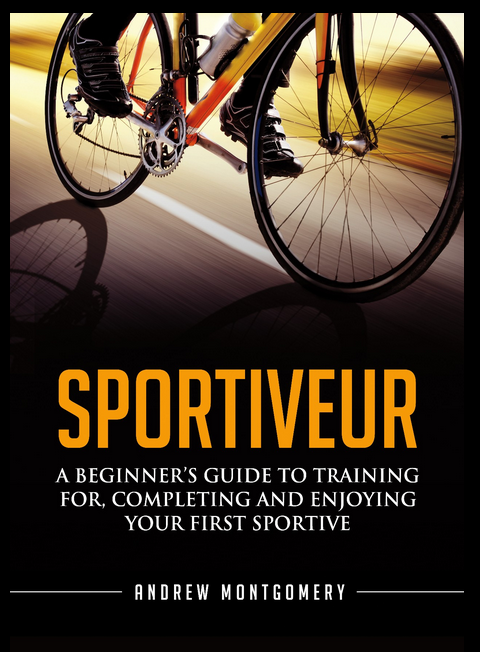 This post has been prompted by a reader question over on the Sportive Cyclist Facebook page. Yes, there is a Sportive Cyclist Facebook page. And yes, this blog has the occasional reader. So, to repeat, what bike would be suitable for the RideLondon 100 sportive? This question wasn’t sent in to me by a recently-retired pro, looking to record the course record. There’s no need to discuss the relative merits of a five grand Pinarello versus a top-of-the-range Trek. Most askers (word?) of this question are going to be relatively new to cycling (or a recent returner) who don’t currently own a bike. They’re not looking to drop top dollar. That said, and because I’m a sneaky so-and-so, whose aim is to spread the Word of Cycling, I am going to assume that whoever does the RideLondon 100 will become hooked by cycling. I will have a slight bias towards recommending bikes that will suit this long term purpose, rather than just for dragging round the nation’s capital for one hot (we hope) day in August. What Are We Asking The Bike To Do? 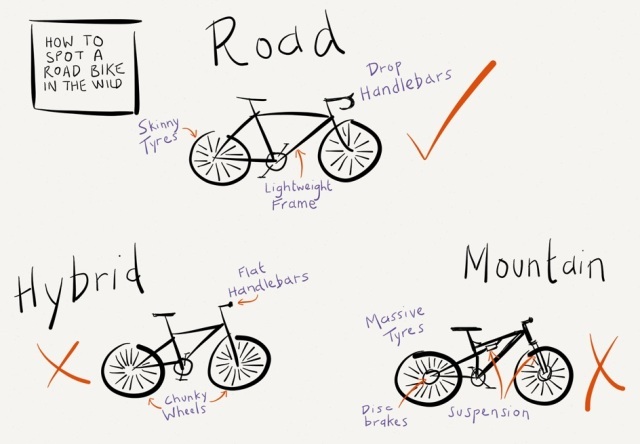 You can’t pick a bike without sketching out what functions we need it to perform. 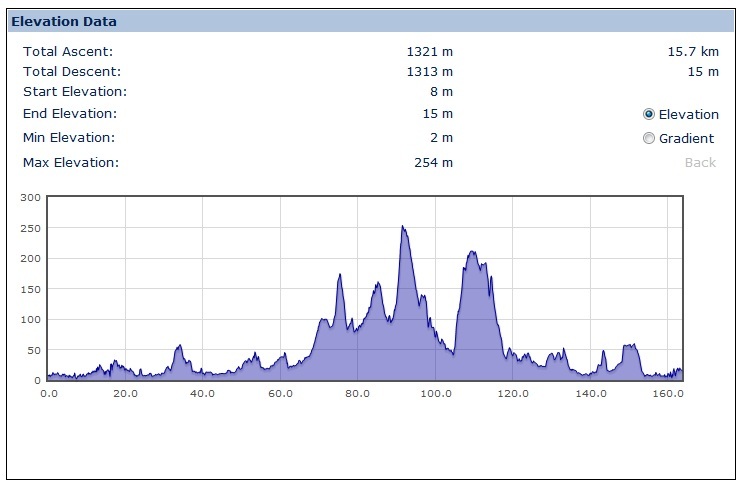 The RideLondon course is, for the most part, fairly flat. Yes, there are few hills on the loop out into Surrey, but the sections through central London and through the south west suburbs are pretty serene (the elevation chart below looks more extreme because the x-axis (distance) is very compressed). One hundred miles is a long way. We need to anticipate a long day in the saddle – somewhere between 5 and 8 hours, depending on fitness, weather conditions, your position on the bike. The whole event takes place on roads. For the most part, and for all that we complain, the road surface is reasonably good (and on Box Hill it’s excellent). Right, so on the basis of our ‘needs analysis’ above, I’d suggest we’re looking for a bike that minimises rolling resistance. The bike needs to put you in a riding position that is comfortable but also allows you to adopt a more aerodynamic position to allow you to cut through the wind. Your steed needs to have a reasonably wide range of gears. You’ll want high enough gears that you can do some high speed stints to really eat into the miles. You’ll need some lower gears to help you get up and over Leith Hill without knackering your legs (or having to walk). I’ve written a long post on the difference between road bikes and hybrids. Essentially we have road bikes (the ones with curly handlebars) at one end of the spectrum, mountain bikes at the other. ‘Hybrid’ is the catch-all term for bikes that sit somewhere in between. You can certainly do the RideLondon 100 on a hybrid bike. When I did RideLondon back in 2013, many people were riding hybrids, including London Mayor Boris Johnson (and some even did it on one of his Boris bikes). The key thing to note when choosing a hybrid bike for RideLondon is that you want one with (reasonably) skinny, smooth road tires and one that does not have suspension forks. Referring back to our ‘needs analysis’, the smooth tires will reduce rolling resistance (i.e. the force you need to apply – and therefore the effort you need to expend – simply to stop the bike from slowing down due to friction between the tire and the road surface). Suspension forks are unnecessary (we said that the road surface was largely good – suspension forks are mainly for off-road trails). They’re also heavy, particularly at the budget end of the price scale. You don’t want to be carting them up Leith Hill if you can help it. In the section below, I’m going to talk about the sort of bike I would look to buy in each of the price ranges mentioned. Before that though, a note about where to get more information, to try and to buy. In terms of getting useful information, I’d say 1 and 2 are pretty evenly matched (though, yes, your local bike shop might be totally AMAZE-balls). Where your local bike shop might swing things in potentially having a bit more insight into the local second-hand bike market. If you have a particularly social LBS-owner, with links into a few local cycling clubs, he might know a few people selling good quality (and safe) bikes at prices within your budget. The main issue with online bike purchases (as I see it) is you can’t even try the bike for size in the showroom, never mind take it for a little test ride. You’re taking a bit of a punt that you’ve self-diagnosed the type and size of bike you require. This is offset by the fact that, as a rule, the best prices for new bikes tend to be found on the internet. So, with a bit of research under your belt (now where would you find a friendly blogster with a range of useful, educational posts to read…) and a tape measure, you should be fine. Admittedly, Wiggle does have online chat on its website, a ‘call back’ service for buying advice, plus a 30 day ‘test ride’ period, so the risk of coming unstuck is fairly low. For choice, I wouldn’t go to a Halfords or another non-bike specific shop to buy a bike (there goes the six figure advertising contract…). I think there are other places you would go first (like the other three places on my list…). The risk of buying a dud bike or getting a dodgy piece of advice is, for me, just too high (says, the King Peddler of Dodgy Advice…). That’s not to say I don’t rate Boardman Bikes, whose ‘mass-market’ bikes are sold (only?) at Halfords. In fact I think (without having ridden one) that Boardman bikes represent great value for money, with good quality components and a reputation for being well-built. When I was buying my Trek Domane, I would have certainly looked at their higher-end models (the ones sold via independent bike shops) if they’d had a frame that was suited to the more relaxed gentleman rider. Do note, though, that none of the guff that I espouse above is based on an objective study. It is mostly uninformed prejudice, like everything else on this blog. There will be exceptions, where you get duff service in an experienced local bike shop and amazing advice from a keen employee of Halfords. You probably know this already, but worth a reminder if you’re looking to buy a sub-£1,000 bike. The ‘Cycle To Work’ scheme allows you to pay for your new bike (and accessories) from your pre-tax income and spread out over a period of time. There are some quirks to be aware of (which this Bikeradar article may or may not help you get to grips with), but essentially you’ll save up to around 40% (depending on your tax rate) of the cost of your bike, helmet, locks etc. Worth looking into whether your employer already has a scheme, or whether you can persuade them to sign up to one. At this price level, you don’t want to be buying a new bike. The only way a manufacturer can price a bike below £400 is to use components that are not going to stand up to a normal amount of use. The frame is likely to be heavy. The idea of training for, and then doing, a 100 mile sportive on a bike like this fills me with dread! At this level, I would be going into local bike shops and trying to spread a net for people looking to sell higher quality and higher specced second hand bikes. I would be trawling my Facebook friends of friends, work colleagues, travelling interpretive dance troupes for anyone that knows a little bit about bikes, to help guide me on the purchase of a second hand bike on ebay. Now things start to get interesting. My first road bike (from memory) cost £499 and was (and still is) a Dawes Giro (a 400 I think – I could go check since it continues to live quite happily in my garage). Let’s ignore the fact that it was tremendously ill-sized for me (as I discovered many years later). It was a good bike, an alloy frame with carbon forks, and basic but reasonable quality gears from Campagnolo. If I was buying a bike in this price bracket now, I’d be looking at a Specialized Allez E5, a Giant Defy 4 or a Cannondale Synapse Claris. Allez, Defy and Synapse are all ranges of bikes – i.e. there is a choice of frames and component specifications at various price points – but the models I’ve mentioned have list prices at or around the £500-600 mark. The Giant Defy and Cannondale Synapse are both specifically marketed as ‘endurance’ bikes, which is manufacto-marketing speak for having a slightly more relaxed riding position and being suitable for longer rides (like 100-mile sportives…). The Specialized Allez has been, and continues to be, the gateway drug to road cycling for many beginner sportiveurs. All three have alloy frames (you might clock that ‘Allez’ sounds a bit like alloy…) and carbon forks (which give a bit of vibration-dampening to the front end of the bike). All three have Shimano Claris gears (as per the name of the Cannondale), which is bottom of the Shimano range but is of good quality and will certainly do the job. Importantly, they all feature compact chainsets (click here for my post explaining what that means), and have a nice low bottom gear, which you will be thankful for as you climb up Leith Hill. You will note that I haven’t suggested any hybrids. Correcto! 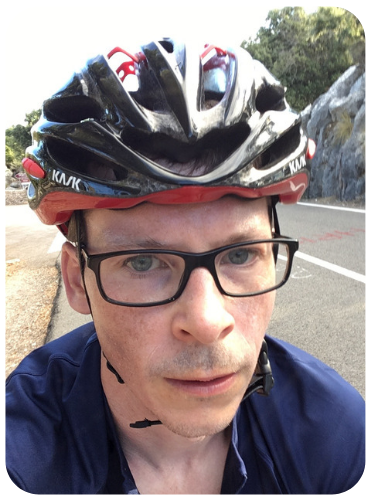 I said at the top of the post that my ultimate aim is to reveal to you the many and varied wonders of road cycling. To that end, I have a vested interest in you buying a road bike. Hence, no hybrids in this section. Sorry…. (though you can use the thought processes I’ve used above to help shape your own research). More of the same really. Specialized does another two Allez models before you hit £1000 (the Allez E5 sport and the Allez Elite Smartweld – no, me neither…). Cannondale has the Synapse Sora, the Synapse Tiagra and, at a gnat’s whisker below £1,000, the Synapse 105. Giant has four (count ’em!) other Defy models in this price bracket, starting with the Defy 3 (which, at £649, is a shade under my arbitrarily-set price range) and ending with the Defy 0 (Defy Noone?). The main thing for new bikes as you move up through this price bracket is that you’re graduating through the Shimano range of gearing systems, firstly to Sora, on to Tiagra and then maxing out at 105 (which the Cannondale naming convention might have given you a clue about…). In the Cannondale range, the Tiagra and the 105 have disc brakes rather than brake-pads-on-rims jobbies (technical term). All else being equal, disc brakes will do a better job of stopping a bike in wet conditions. I haven’t done an exhaustive test of each chainset but I reckon the main thing anyone would notice between Claris, Sora and Tiagra, is the addition of an extra two gearing combinations each time you move up the price scale (Claris provides 16 combinations, Sora 18 and Tiagra 20). Shimano 105 is present on more expensive bikes than these £999 ones (including my own) and is very highly regarding by those in the know (i.e. people other than me). It’s probably worth noting though that these new gears are added in the middle of range. The highest and lowest gears are the same on all the bikes mentioned above (Leith Hill becomes no easier), it’s just that the gear ratios in between are closer together. There are of course a wealth of other bike makers with high quality offerings in this price range. If it was me buying the bike, I’d also be looking at what is available from German manufacturers Canyon and Rose, from Cube, and from Ribble Cycles (worth looking at their online bike builder if you want to try out a variety of component specifications to see how they impact price). Then the world is your oyster. There are plenty of people spread around bike shops, magazines and seedy internet cantinas that will help advise you on what bike to buy. What I would say though is this. Over a grand is a good-sized amount of cash to be dropping on a bike. For that sort of money, I’d be looking for something that is comfortable, will last a long time and will go quickly. Long-term blog readers will perhaps be wondering why it’s taken me so long to mention this but… I think that if you’re going to spend over £1k, you should consider getting a proper bike fit at the same time. It’ll make sure that the bike is the right size in the first place and, once on the right-sized bike, your body is positioned for putting down the maximum amount of power (i.e. going quickly) whilst still being comfortably over the 6+ hours you might be spending in the RideLondon saddle. Of course, I’d recommend getting a bike fit even if you’re getting a cheaper bike, but I appreciate that spending up to £100-200 on one (depending on the type of bike fit) could be counter-productive if it means you can then only afford a sub-standard bike. If you’re buying an established bike brand or model, always see if last year’s model is still available. The only difference between the current model and last year’s one is likely to be the paint job and the fact you still have £50-100 left in your pocket when you buy the older bike. The important stuff – the frame, the components – tends to stay pretty consistent over time. So there you have it. The RideLondon 100 is, unlike some 100-mile sportives, fairly forgiving in terms of what bike you can use. If Boris can do it on a hybrid, I’m sure you can too. For my money though, surely you want to take this opportunity to get started on the path (climb?) to road cycling enlightenment and get yourself a bike with drop handlebars and skinny tyres? If you’ve already seen the light (or you disagree with me entirely), feel free to share your own bike buying recommendations in the comments below. What Is The Best Garmin Edge For Cycling in 2017? Are You Looking For An Entry For RideLondon 2016? A delightful & helpful read as always! Greetings from Australia. I rode the London 100 last year for the first time. But being a big guy (6’1 and over 19 stone) and in my 50’s, I decided to go with a hybrid. More of a Town bike (Kona make) I put skinny tyres on it and have loved the bike since.The low gears work well for me on the hills as I struggle to get up them. I also love the disc brakes, they give me the confidence to go faster downhill knowing I can stop quickly if need be. I find the bike comfortable too. I know I’m never going to be Bradley Wiggins but it does the job for me. I did take over eight hours to do the 100 but I used the stops, taking advantage to refuel, rehydrate and have a little rest towards the end. I was worried that this being my first time I did not know how my body would react (Would I die or just get the shits?) Although I trained a lot beforehand it was at the back of my mind. Riding for that distance and for that length of time I felt I had to be careful. I will say your blog was ace for giving me the confidence to believe I could do it. Although I did not get a place on the ballot this year, I am hoping to get a place through other avenues to take part again. I will even be looking to take part in a couple of shorter sportives too. Many thanks Monty and keep up the good work. Great advice and an easy read to boot. I completed my first century on a hybrid (so it can be done – but took me a long time) but have now acquired a Synapse and hope for an easier time on future centuries. You mention ‘slick tires’ – I have upgraded my tires – seems a relatively cheap step to improve comfort / speed. Followed your advice before my ride in 2014 and took my Boardman Team Carbon for a bike fit. Result – too big for me. Gave me the perfect excuse to buy a Trek Domane 4.3 and give my Boardman to my (taller than me) son who also rode it on the 2014 Ride London. We both finished the shortened event – and he even got to speak to Chris B at the finish! We rode the bikes on Velothon Wales in 2015 which I reckon with the Tumble and Caerphilly Mountain is tougher and finished – so I conclude that the Boardman Team Carbon is just fine – if you buy the correct size. The problem is that Halfords generally aren’t geared up to fit you properly so you need to know what you need. I did like my Boardman though so now have another one (medium not large) upgraded to Ultegra 11 Speed as #2 bike. It is quicker than the Domane and I have done 100Km+ training rides without any ill effects. My winter bike is a Boardman as is my Hybrid – they are very good value! Sadly failed again in the ballot this year and as I rode for Asthma UK in 2014 didn’t think I could go back to friends and family again so soon.